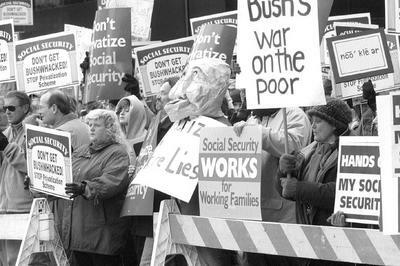 In Louisville, Ky., workers, active and retired, young and seniors, chanted and carried signs outside the Kentucky Center during President Bush’s election-style sales pitch for Social Security privatization, while three were removed from inside the auditorium. In Memphis, Tenn., four protesters were ejected from Bush’s appearance before a hand-picked crowd. In Montgomery, Ala., the labor federation rallied. And in Shreveport, La., residents protested both Bush’s privatization hustle and the occupation of Iraq. As Air Force One headed to Florida, Arizona, New Mexico and Colorado, polls showed that 56 percent disapprove of Bush’s handling of Social Security while only 37 percent support privatization. “If he’s having difficulty in selling his plan in red states,” Tennessee Congressman Harold Ford (D) told reporters, “you can imagine how much harder it will be in the blue states.”Outside Bush’s Louisville “infomercial,” as some Southern media termed it, a loud group of about 150 chanted, “No more lies, don’t privatize.” Retired teacher James McMillin, 59, managed to slip off the picket line and into the Kentucky Center to hear Bush. When McMillin discovered that audience questions were not allowed, he decided to interrupt, shouting that Bush “is trying to do away with Social Security.” He was one of three audience members tossed out. “Other people need to be heard rather than the lip service that apparently Mr. Bush is coordinating and orchestrating for most of his appearances,” he told reporters outside the center, with security guards at his shoulder. The first of 12 California town hall meetings on preserving Social Security, in Orange County, March 12, featured a keynote address by Rep. Loretta Sanchez (D-Orange County), who recounted the reasons the Bush administration’s privatization program will not assure a secure future to retirees, survivors and the disabled. Visits are planned to urge area members of Congress who did not attend the meeting, to strongly oppose the administration’s proposals. While a majority of the more than 100 people who gathered at Teamsters Local 952 in Orange were seniors, many younger people participated including a number in their 20s and 30s. The audience also heard state Senator Joe Dunn (D-Garden Grove) take on Gov. Arnold Schwarzenegger’s proposal to privatize pensions for all new state workers. Assemblyman Tom Umberg (D-Santa Ana), County Supervisor Lou Correa, Al Ibarra of the Orange County Federation of Labor, Patrick Kelly of Teamsters Local 952 and Tim Smead of the Young Democrats addressed the crowd. Working families are fighting hard to save Social Security, since 1935 the most successful program ever initiated and sustained by the government. Their leaders see a more sinister and dangerous agenda behind the Bush rhetoric. Lynn Williams, former president of the United Steelworkers of America, currently heads the Steelworkers Organization of Active Retirees (SOAR), which speaks for hundreds of thousands of former steelworkers in the U.S. and Canada. He believes that privatization is a Bush bailout for Wall Street. Williams has cause for optimism. In a March 15 series of non-binding resolutions, a kind of straw poll, the Republican-controlled U.S. Senate split 50 for and 50 against a resolution reading, “Congress should reject any Social Security plan that requires deep benefit cuts or a massive increase in the debt.” Five Republicans joined all 45 Senate Democrats in supporting the resolution. The five were Susan Collins and Olympia Snow of Maine, Ohio’s Mike DeWine, Lindsey Graham from South Carolina and Arlen Specter of Pennsylvania. All those letters, faxes, lobbying days, demonstrations, phone calls, e-mails and home visits are having an effect.